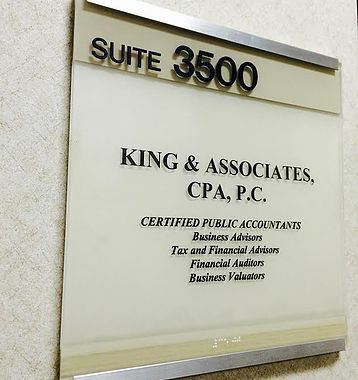 Here at King and Associates CPA PC, we believe in the value of long term relationships. We view every client relationship like a partnership and truly believe that our success is a result of your success. Our firm has sucessfully been accepted to the AICPA Peer Review Program, and the New York State Society of Certified Public Accountancy Society. Robert King is also a member of the National Association of Certified Valuation Analysts. We are committed to providing close, personal attention to our clients to assure that the services we provide you with are always at our highest standards. We take pride in giving you the assurance that the personal assistance you receive comes from years of advanced training, technical experience and financial acumen. We will answer all of your questions, as they impact both your tax and financial situations. We welcome your concerns and feedback anytime. We submit to a "Peer Review", whereby an independent CPA firm examines our accounting and auditing practice to ensure that our practice is conducted within the strict guidelines of the profession. Our latest peer review was issued October 21, 2016. In their report, we met all acceptable practice standards, and complied within the parameters as established by the regulatory body of the AICPA.